Wire termination isn’t a very hard task to accomplish, and the right tools make it a snap. 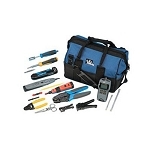 Greenlee’s Voice and Category 5 Data Termination Kit comes with everything you need to make proper wire terminations. Modular connectors and a wire stripper/cutter are included to prep the installation, and a crimper and a punchdown blade are available to terminate the wires for telecom and data communications such as phone lines and Cat5 Ethernet networks. 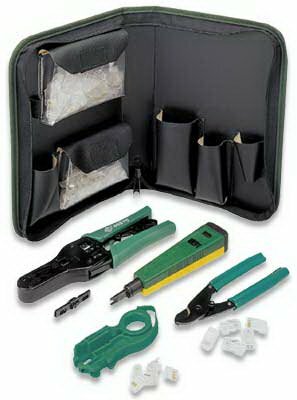 Everything in the Greenlee Voice and Cat 5 Data Termination Kit fits in a rugged Cordura Plus case, convenient for keeping everything organized and protected.